Seventeen-year-old Tom Robinson Lee (John Kerr), a new senior at a boy's prep school, finds himself at odds with the machismo culture of his class in which the other boys love sports, roughhouse, fantasize about girls, and worship their coach, Bill Reynolds (Leif Erickson). Tom prefers classical music, reads Candida, goes to the theater, and generally seems to be more at ease in the company of women. The other boys torment Tom for his "unmanly" qualities and call him "sister boy," and he is treated unfeelingly by his father, Herb Lee (Edward Andrews), who believes a man should be manly and that his son should fit in with the other boys. Only Al (Darryl Hickman), his roommate, treats Tom with any decency, perceiving that being different is not the same as being unmasculine. 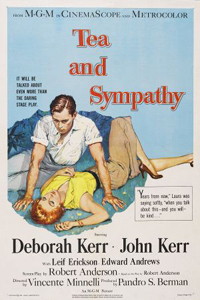 This growing tension is observed by Laura Reynolds (Deborah Kerr), wife of the coach. The Reynoldses are also Tom's and Al's house master and mistress. Laura tries to build a connection with the young man, often inviting him alone to tea, and eventually falls in love with him, in part because of his many similarities to her first husband John, who was killed in World War II. The situation escalates when Tom is goaded into visiting the local prostitute Ellie (Norma Crane) to dispel suspicions about his sexuality, but things go badly. His failure to lose his virginity causes him to attempt suicide in the woman's kitchen. His father arrives from the city to meet with the dean about Tom's impending expulsion, having been alerted to Tom's raffish intentions by a classmate. Assuming his son's success, he boasts of his son's sexual triumph and time-honored leap into manhood until the Reynoldses inform him otherwise. Laura goes in search of Tom and finds him where he often goes to ruminate, near the golf course's sixth tee. She tries to comfort him, counseling that he'll have a wife and family some day, but he's inconsolable. She starts to leave, then returns and takes his hand, they kiss, and she says, "Years from now, when you talk about this, and you will, be kind." Ten years into the future the adult Tom, now a successful writer and married, returns to his prep school. The final scene shows Tom visiting his old coach and house master to ask after Laura. Bill tells him that, last he's heard, she's out west somewhere but he has a note from her to him, which she enclosed in her last letter to her ex-husband. Tom opens it outside and learns that she wrote it after reading his published novel, derived from his time at the school and their relationship. After their moment of passion, she tells him, she had no choice but to leave her husband, as Tom wrote in his book, "the wife always kept her affection for the boy." Robert Anderson, the author of the play, was also the screenwriter of the film. Due to the Motion Picture Production Code homosexuality is not mentioned in the film version. In 1956 Bob Thomas of the Associated Press wrote that "many said [the play] could never be made into a movie." Deborah Kerr, the leading actress, said that the screenplay "contains all the best elements of the play. After all, the play was about the persecution of a minority, wasn't it? That still remains the theme of the film." The story's climax is written to be in a "sylvan glade" while in the original play it takes place in the dormitory room of the student. Bosley Crowther gave a positive review and felt the movie was faithful to the play despite obvious Motion Picture Production Code alterations. Crowther also felt the post-script (original to the movie) with "an apologetic letter from the 'fallen woman' " was "preachy [...] prudish and unnecessary" and recommended that cinemagoers leave after the line "Years from now, when you talk about this—and you will—be kind." Deborah Kerr said in regard to the screenplay that "I think Robert Anderson has done a fine job." According to MGM records, the film earned $2,145,000 in the US and Canada and $1.3 million elsewhere resulting in a loss of $220,000. ^ a b c d Thomas, Bob. "Deborah Kerr Signs For Unusual Role." Associated Press at the Milwaukee Sentinel. Thursday May 17, 1956. Part 2, Page 15. Retrieved from Google News (9 of 18) on November 8, 2013. ^ Review by Bosley Crowther, New York Times, September 28, 1956. ^ "AFI's 100 Years...100 Passions Nominees" (PDF). Retrieved August 20, 2016. ^ "AFI's 100 Years...100 Movie Quotes Nominees" (PDF). Retrieved August 20, 2016.